Sometimes folk artists are born of wild country seclusion lacking connection to high art institutions. Others grow from financial or cultural inaccessibility. It's an unusual folk artist who emerges from an urban, blue collar environment, but Scout (aka Brian Buono) is just that rare creature. Scout's creative foundation was laid in the worlds of punk rock and graffiti art. That's where he began to view art as something universal, to be made with any tools available. When Scout discovered the work of Howard Finster, an outsider artist from Georgia who gained renown in the 1980s with his album covers for R.E.M. and Talking Heads, it solidified his sense that art wasn't just made by art school grads. At a screen printing shop in Chatham, Scout learned the spray paint stencil method that he still uses today. Working in construction, Scout was drawn to utilitarian materials like latex and oil house paint, wood stain, sign paint, and marker that can survive outdoor installation. He continues to forego traditional fine art materials. 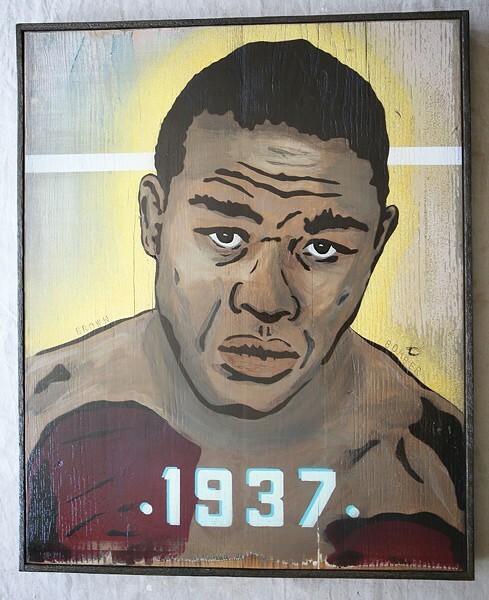 The painting on this month's cover is a portrait of the boxer Joe Louis, created in stencil, then spray painted in a reductionist style on reclaimed wood. The frame is made from plaster lathe scavenged from a burned house in Athens. In exploring derelict urban buildings, Scout acquires found objects to use as canvases. Mindful of the lost art of hand-painted signs, he's drawn to old signage and pieces of metal and wood. "Those pieces themselves have tremendous history," says Scout. "Hanging up in old steel mills or rail yards, thousands of people may have seen them going to work, or looked to them for instruction." Louis looks expressively at the viewer, boxing gloves lifted at the ready, the year of his heavyweight championship win floating before him. As with the backgrounds he discovers, Scout says, "The image finds me." He starts with a photo in the public domain that conveys a sense of timelessness, and then reinterprets it in paint. At times, there's a particular person whose experience Scout seeks to amplify. "There's a social context to the work that I create that's important to me," Scout explains. For Scout, Louis is a compelling figure, having navigated a tenuous place in American history: at once famous and revered but also of a time when someone could be nicknamed the Brown Bomber. A soft gold line encircles Louis's head and shoulders in the portrait, almost like a halo. Because it stems from a stencil, the portrait is infinitely reproducible and poster-like. In areas of Harlem where Louis spent time, Scout spray painted Louis's portrait on the plywood that boarded up the windows and doors of condemned buildings—both an offering to passersby and a testament to Louis.